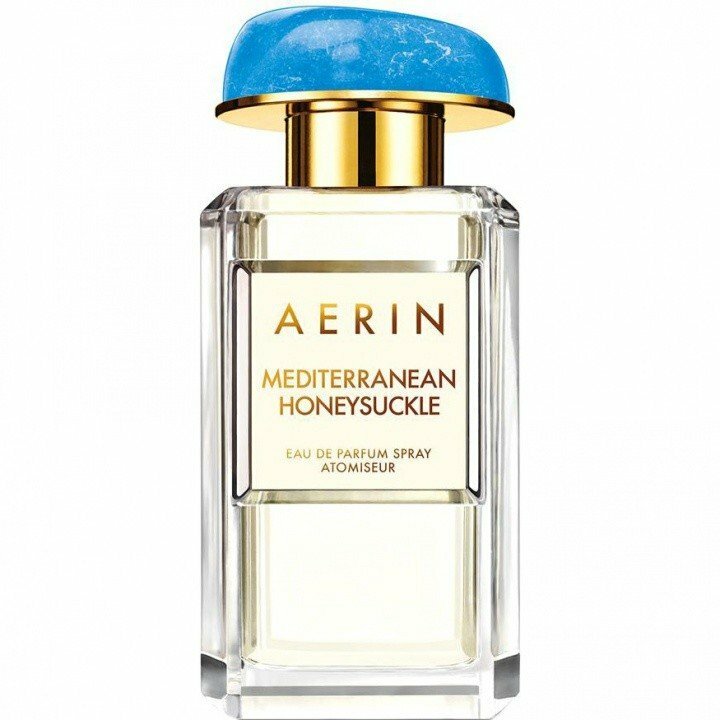 Mediterranean Honeysuckle is a popular perfume by Aerin for women and was released in 2015. The scent is floral-fresh. It is being marketed by Estēe Lauder Companies. Today I would like to introduce Mediterranean Honeysuckle by Aerin. A fragrance which, due to its English name, certainly makes you think of sweet honey. But this is not necessarily wrong, because Honeysuckle is not called "Honeysuckle" for nothing, because the sweet scent of this plant actually reminds of honey. From the appearance these plants (as an umbrella term for all honeysuckle species) are called here in Germany but also as hedge cherries, of which one should rather not nibble, since some are weakly poisonous and also should have no aroma at all (from the specially cultivated hedge cherries, the May berries, apart from that, ... great, now they are suddenly also called berries ... argh that's complicated! :D). Anyway, here comes the description of the fragrance! The fragrance begins quite fresh with sparkling grapefruits that smell authentic and great. In addition to bergamot I also smell mandarins as a further citric note, from which one can smell the slightly bitter inner shell more. Flowery notes appear, but are still weak, so you can't determine them yet, well, not me anyway. After the flowery notes get a little more intense, I think I can smell the gardenias out of them best first, because the other flowery notes should actually smell sweeter and the scent is not really sweet yet, but still citric and green with a very light clean note that comes across a little soapy. But a little later the scent slowly becomes sweeter, I smell the lily of the valley, which together with the jasmine gives the scent a nice, tender sweetness. You can still smell the citrus notes, which is great and keeps the fragrance fresh and loose. Hmm... I haven't heard a Honigartige sweetness now by the way, since the sweetness came as I said from the Jasmin and from the lily of the valley. I think the honeysuckle here with this scent has just here rather tangy/herbaceous and green scented. The Sillage is slightly above average, so that the fragrance will smell good on you for a short while if you are not too far away from others. The shelf life is very good, you can smell the scent for eight to ten hours. The bottle is rectangular with bevelled corners so that it is actually octagonal. On the front you can see a white label with a golden frame, and also the name of the fragrance is written in golden letters there. The lower part of the lid is gold-plated. The upper part of the lid looks like polished stone in azure blue colour, making the lid a real eye-catcher. All in all a very nice bottle. Ah, this scent has become really beautiful! He radiates a nice aura, which simply provides for satisfaction. It is reminiscent of beautiful meadows and flower fields, where you can walk past or walk in spring and summer, relax and enjoy the colourful nature, which may even make you feel a little happier. Nearby are lemon trees, whose citric fruits glow yellow like the sun from far away. If you are lucky enough to see beautiful butterflies buzzing around, which are more welcome insects besides all the mosquitoes (which also appear in spring), then the day is actually perfect. Write the first Review for Mediterranean Honeysuckle!